Da Bears Blog | Excluding Cleveland: How Quickly Do Perennially Bad Offenses Actually Turn It Around? 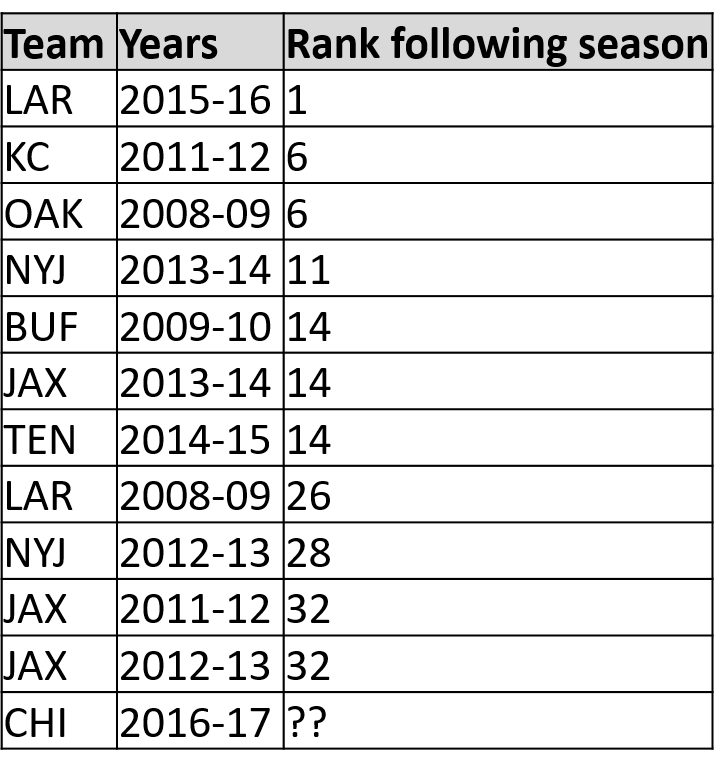 Excluding Cleveland, there have been eleven instances within the past decade where teams fielded a bottom five scoring offense for two straight seasons. 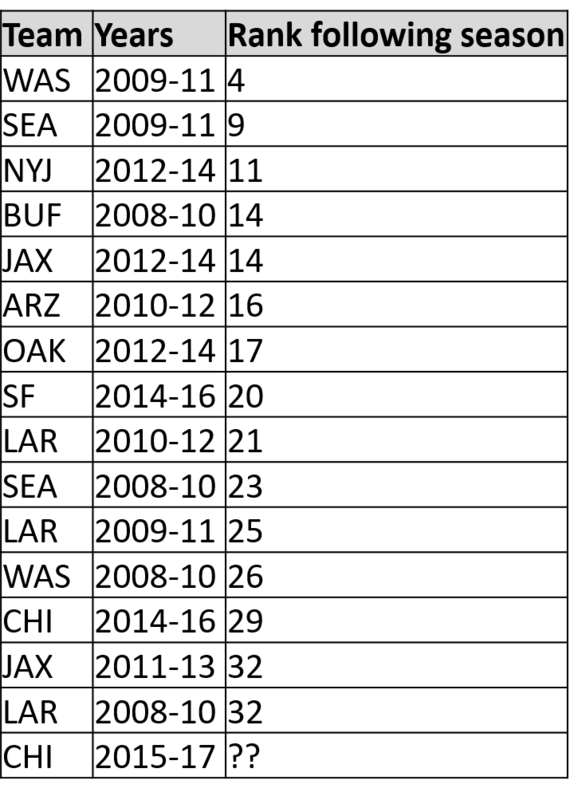 The teams and how they fared the following season are listed below. Here we can see that improvements in year three run the gamut. Three teams went straight to having top offenses, four became around average, and four stayed really bad. Overall, their average rank following two years in the bottom five was almost exactly average. Excluding Cleveland, there have been fifteen teams in the last ten years who fielded a bottom ten scoring offense for three straight seasons. The teams and how they fared the following season are listed below. Once again, we see that not all teams make the same improvements. Here the teams are less clustered, with a pretty good spread ranging from top-level offenses to really bad ones. Overall the average is around twenty. Now let’s look at the teams from that group who kept a bad offense for a fourth year. There were five of them who stayed in the bottom ten (excluding Chicago, who we haven’t yet seen year five for); how did they fare in year five? That information is shown below (again, excluding Cleveland). That’s encouraging. 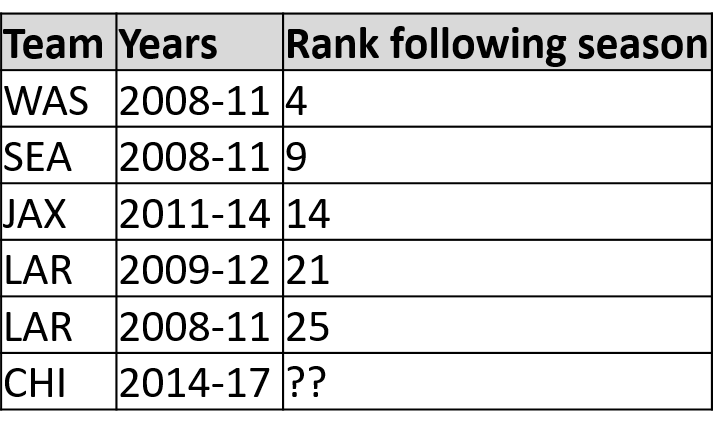 Only one team (excluding Cleveland) has managed to field a bottom ten scoring offense for five straight years in the last decade, and even they showed marginal improvement in year six. Overall, the average for these teams the year after a bad four-year stretch is right around average. Unless you’re Cleveland, it’s hard to be consistently bad on one side of the ball for too long, which means that odds are the Bears are likely to see some offensive improvement this year. But just how much improvement is realistic to expect? Seven out of the 31 teams in this sample size have jumped directly to a top ten scoring offense. Another eleven ending up somewhere in the middle of the pack (between 11th and 20th). Of course, that means twelve still stayed somewhere in the bottom twelve. Looking at the seven teams who had top ten scoring offenses, I think there are some promising similarities to what Chicago is looking at this year. All of them featured either a new starter at QB or a highly drafted QB entering his 2nd season, and 2 of them featured a new coach installing a new offense. So there is certainly the potential for the Bears to jump up to a high-scoring offense in 2018, but a more cautious expectation might be to think they end up somewhere around average. That’s where the majority of teams with a QB entering year 2 ended up; the 2015 Jaguars (Bortles), 2016 Titans (Mariota) and 2015 Raiders (Carr) all broke out of years-long offensive slumps and ended up between 14th and 17th in points scored, which is about as average as it gets. Matching that level of improvement would be an excellent sign of growth from the 2018 Bears. And with virtually the entire offense locked in for 2019 as well, it would hopefully be a sign of even better things to come.